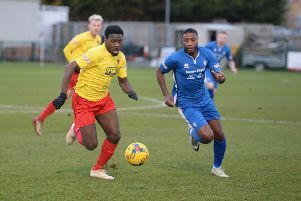 Dunstable Town couldn’t complete the double over Weymouth on Saturday as they went down to a 2-0 defeat. After winning the home game 2-0, back in January, the Terras were just good on this occasion, easing past Tony McCool’s men. The visitors handed a debut to goalkeeper Nathan Harness signed on loan from Stevenage, as they started brightly, Jake McCarthy cutting out a ball to Andrew Osei-Bonsu. However, Weymouth then assumed a dominance they were to keep, Abdulai Baggie curling wide and Josh Carmichael’s long range free kick well saved by Harness. Ben Thomson also shot wide, but Dunstable did threaten occasionally, Ty Ward breaking through and forcing Will Dennis into a meaningful stop. The deadlock was broken by the Terras on 42 minutes though when Carmichael found Calvin Brooks in the area and his effort flew past Harness. Two minutes into injury-time Brandon Goodship bagged his 29th league goal of the season as Dunstable’s defence switched off and he netted from six yards. After the break, Callum Buckley was off target, while McCarthy’s 25-yard curler was saved by Harness. The debutant had to come out and smother at the feet of Goodship, with McCarthy unable to turn the loose ball home, blazing over. Further good work from Carmichael and McCarthy saw the latter cut back to Buckley near penalty spot but the defender fired into the stands. Weymouth had further chances to increase their lead and never looked like conceding, Osei-Bonsu’s cross collected by Dennis. Late on, Harry Baker had the ball in the back of the net, following a pass from Goodship but his celebrations were cut short by the linesman’s flag. Dunstable are at home to local rivals Hitchin Town on Saturday. Dunstable: Harness, Ladipo, Okito, E Amu, Trif, Ogden, Williams, Osei-Bonsu, A Amu, Lamptey, Ward (Black 60).